It turns out that the 50th anniversary of JFK’s assassination is the 100th anniversary of the birth of the Federal Reserve at a secret meeting at Jekyll Island, Georgia, USA. Coincidence? Perhaps. But perhaps someone was trying to send a very specific message about who is in charge. The New York Times later noted, on May 3, 1931, in commenting on the death of George F. Baker, one of J.P. Morgan’s closest associates, that “Jekyll Island Club has lost one of its most distinguished members. One-sixth of the total wealth of the world was represented by the members of the Jekyll Island Club.” Membership was by inheritance only. The Federal Reserve was created on Jekyll Island in complete secrecy by, who else, representatives of the big NY and European banking families. It gave the Federal Reserve the power to create the nation’s currency. This was unconstitutional then and now since the US Constitution delegated that power solely to Congress and that section of the Constitution has never been amended. It turns out that JFK used Executive Order 11110 in an attempt to return the power to create US money to the US Treasury. He correctly saw that the US debt was building; that this would be bad for the country; that US money should be created directly by the Treasury and backed by gold and/or silver, not loaned into existence by the Federal Reserve, causing the US to have to pay interest on every dollar created. And there is absolutely no good reason for that “loaning into existence”, except from the point of view of those who do the loaning, namely the banks, who make astronomical profits from this process, saddling the US and its citizens with ever-increasing debt from which there is no escape. As this chart shows, the US Consumer Price Index was remarkably steady until the creation of the Federal Reserve in 1913. 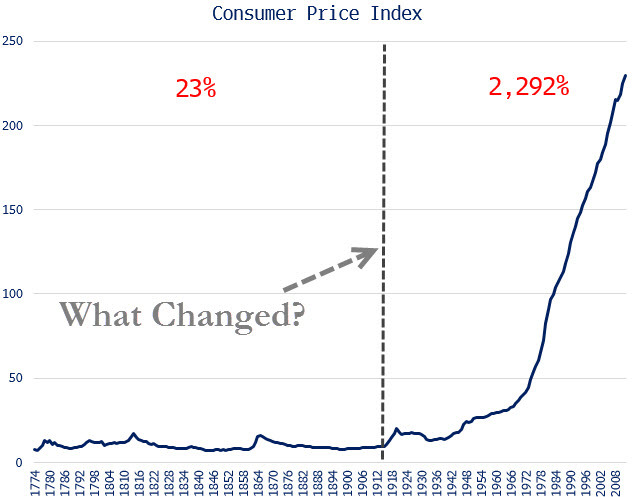 It has been on an explosive upward path ever since, leading most people alive today to believe that inflation and price increases are normal. They are not! Here is a well-written account of the activities at Jekyll Island that created the Federal Reserve. It is the source of the NY times quote above. And here is an account of JFK’s Executive Order. It is the source of the quote above about Kennedy’s attempt to change this situation. And on the question about coincidence, another US President issued currency directly, with no interest due to anyone; Abraham Lincoln was also assassinated while in office. I salute Abraham Lincoln and John F. Kennedy, warriors for our freedom. I had no idea that Lincoln tried the same thing…hmm. I’ve often thought that this was the reason…..it is like a Mid East country not wanting to use petro dollars.